Elite Motor Sports aims to provide car and truck owners in Woodland with the best in accessories and service, helping you upgrade your vehicle in the name of both performance and aesthetics. Whether you’re looking for lift kits, suspension service, custom made exhaust systems, tires, or wheels, Elite Motorsports is proud to serve the greater Woodland area with the best in all these and more, all with a commitment to quality service. To learn more about our Woodland professional auto repair and accessory shop, contact or visit us today! In our previous blog post, we looked at a handful of reasons why you should consider lifting your truck. We provide our customers with a variety of truck lift kits here at Elite Motor Sports, from brands like Full Throttle, Cognito and Bulletproof, as well as the knowledge and ability to help answer any lifting-related inquiries that you may have. We know and understand the benefits of lifting your truck, and with this in mind, we’ll look at a few more benefits of lifting your truck in this blog post. If you’re the sort of person that is considering lifting your truck, chances are you care greatly about your vehicle, and have probably invested a considerable amount into it already. The last thing you want is to see your beloved truck be damaged or suffer something else that could impact it’s overall lifespan. Depending on the size of your garage and the amount that you have lifted your truck, you will be able to park your car indoors as opposed to outdoors. By storing it indoors, you’ll be able to protect it from vandalism and potential theft. Additionally, storing it indoors can help reduce the amount of wear that it receives to its body and other exposed parts, helping you ensure that your truck lasts you for years to come. Simply put, lifting your truck will help increase your overall towing ability. While it won’t do miracles in terms of the amount of weight that you tow, it will make your overall ride while towing much smoother, and will make the process of attaching and detaching whatever it is that you choose to tow. If you’re used to towing a trailer, boat, or other large loads, lifting your truck even a few inches will provide you with a noticeable difference in your overall towing abilities. 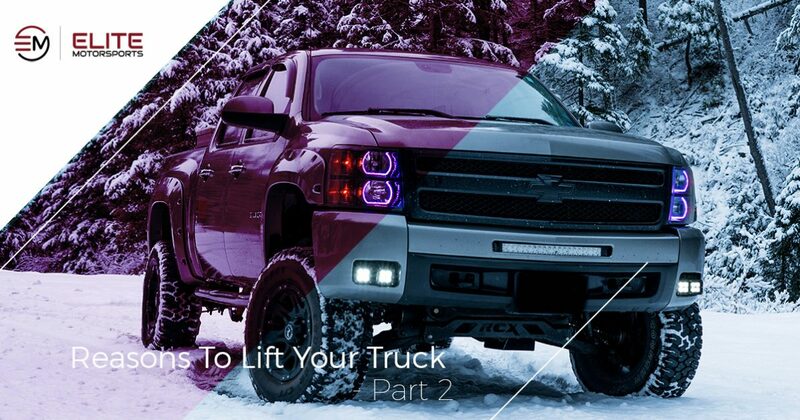 Those are just a few more examples of ways that lifting your truck can be beneficial to you. If you’re considering lifting your truck in Woodland, then look no further than the professionals at Elite Motor Sports. With the experience in having provided many other Woodland residents with quality truck lift kits, as well as quality work from our own shop, we can provide you with the truck lifting products and services that you need to help give your truck the look and functionality that you need. To learn more about our Woodland professional auto repair and accessory shop, contact or visit Elite Motor Sports today! ©Elite Motorsports® | All rights reserved.